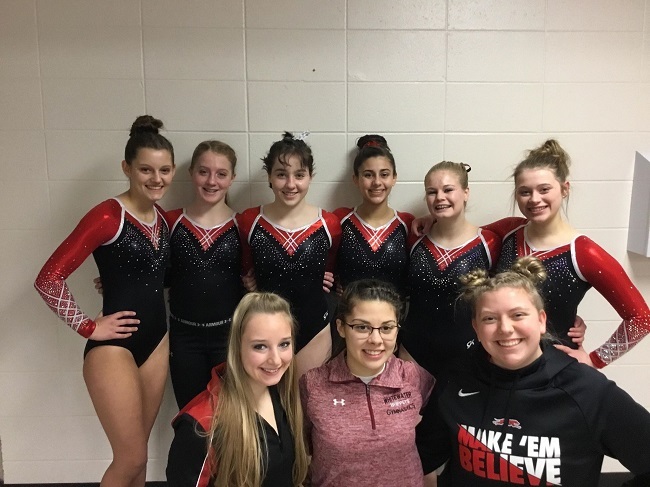 The Whitewater High School Gymnastics team headed to Platteville on Saturday, February 9th to compete in a 13-team invitational. Out of the 13 teams, there were approximately 65 competitors on each event. The highlights of the invitational included Katherine Stanizewski tying for 18th on the Floor Exercise scoring a personal high of 8.5. Katherine also placed 22nd on the Balance Beam scoring a 7.9. Nicole Tomomitsu also had a successful meet placing 18th on the Uneven Bars scoring a 7.7. Autumn Lesar placed 16th on Vault scoring an 8.3 and tied for 23rd on the Floor Exercise scoring a personal high of 8.4. Lastly, Trinity Nickels Placed 22nd in the All-Around scoring a 30.875. As a team, the Whippets placed 10th with a score of 121.775. If you want to see more flips and twists, come support your Whippet athletes at Jefferson on Friday February 15th as they compete at their Conference meet! !